The worlds first DIY shed made of Wood-Plastic Composite(WPC) material, fuses the advantages of wood and resin to offer the best of both worlds. An environmentally friendly shed, made of residual wood fibre and recycled thermoplastics. The Fusion shed's construction integrates the strength, rigidity, and natural beauty of wood with the superior durability and maintenance-free qualities of resin. Its elegant design and the rich beauty of its wood-grain appearance make it a perfect match for your home and landscaping. Exquisite design - unmatched sturdiness - great longevity.the Fusion 7.5 x7 shed has it all. The wide double doors, skylight, air vent and an internal height of more than 8, will make it an extremely versatile storage shed. Furthermore, the walls of this shed are drillable and provide flexible mounting options of hangers, racks, slot walls or pegboards (not included) for freed up floor space and better organization of tools and equipment. Attractive, horizontal siding combines with a vinyl coating to give you a handsome and durable storage solution. A roomy, gable roof allows for plenty of headroom with space to work, hang tools and store equipment. Long-lasting vinyl-coating over galvanized steel is abrasion/scratch resistant and provides five times thicker finish than standard steel in an attractive vinyl horizontal siding configuration. Includes two sky-light panels for improved interior lighting. Spare your neighbours and yourself from the unsightly refuse receptacles outside your dwelling by concealing them in this tasteful cypress storage shed from Leisure Season. It shields contents from precipitation and keeps four-legged creatures and birds from rummaging through trash and recyclables. Toss garbage bags in one-handed via the gas-shock-aided lift-up lid and manoeuvre bins and cans into and out of the horizontal shed through the dual front doors. The solid wood used to construct this outdoor organizer is a decay- and insect-resistant lumber stained a medium brown and coated with a protective finish to ensure long-lasting use. The Lifetime 7 ft. x 4.5 ft. compact shed is ideal for a driveway or carport where there is limited space. Keep lawn tools or automotive supplies handy, safe, and secure in this highly durable, low maintenance Lifetime shed. Constructed from UV-protected, high-density, double-walled polyethylene plastic with steel reinforcements. Won't rust or dent like metal sheds. Won't fade, crack, or splinter like wooden sheds. This shed comes with a 30-inch x 10-inch shelf, two corner shelves, and a full-length skylight. Steeply pitched roof allows for quick drainage of rain and snow, and the shorter roof span allows a greater snow load capacity than our larger sheds. Double-wide doors allow for easy access. Slip resistant surface, oil, solvent and stain-resistant polyethylene plastic floor is included. Keep your tools organized and located right where you need them in the driveway. 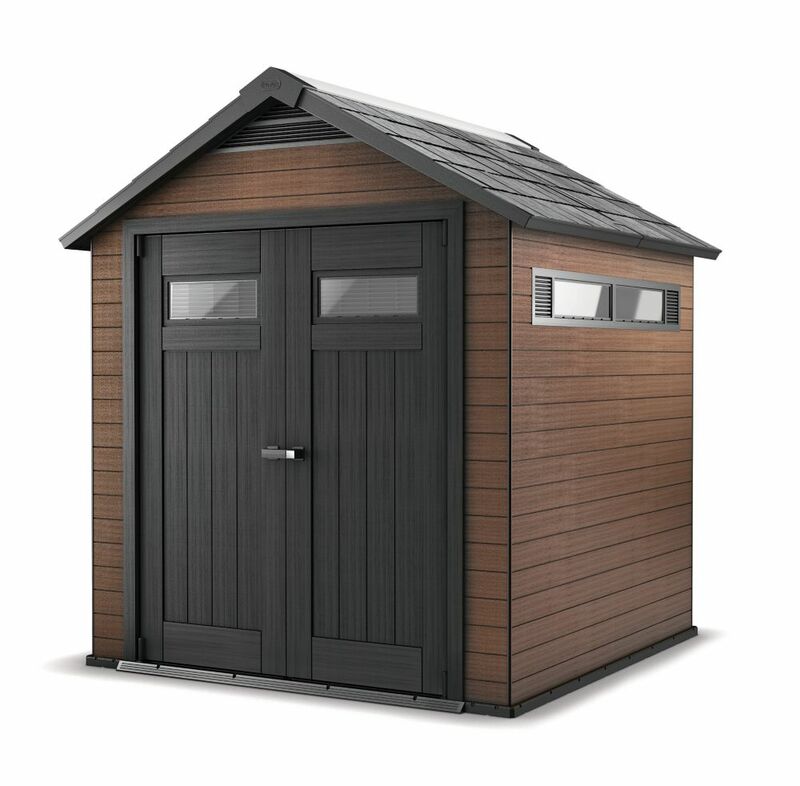 This Lifetime 7 ft. shed is backed by a 10 yr. warranty. The Vertical Storage Shed has a heavy duty, impact resistant floor and can accommodate wood shelving. With a storage capacity of 17 cubic feet, it's the perfect size for storing long-handled tools and smaller outdoor items. It is maintenance free: no rot, no rust, no problems. It is easy to assemble, durable, leak-resistant, dent-resistant and weather resistant. Fusion 7 1/2 ft. x 7 ft. Wood-Plastic Composite Shed The worlds first DIY shed made of Wood-Plastic Composite(WPC) material, fuses the advantages of wood and resin to offer the best of both worlds. An environmentally friendly shed, made of residual wood fibre and recycled thermoplastics. The Fusion shed's construction integrates the strength, rigidity, and natural beauty of wood with the superior durability and maintenance-free qualities of resin. Its elegant design and the rich beauty of its wood-grain appearance make it a perfect match for your home and landscaping. Exquisite design - unmatched sturdiness - great longevity.the Fusion 7.5 x7 shed has it all. The wide double doors, skylight, air vent and an internal height of more than 8, will make it an extremely versatile storage shed. Furthermore, the walls of this shed are drillable and provide flexible mounting options of hangers, racks, slot walls or pegboards (not included) for freed up floor space and better organization of tools and equipment. Fusion 7 1/2 ft. x 7 ft. Wood-Plastic Composite Shed is rated 4.2 out of 5 by 188. Rated 5 out of 5 by StowJames from Nice shed, built in about 3 -1/2 hours with two... Nice shed, built in about 3 -1/2 hours with two people. Rated 5 out of 5 by Akog from The shed was far easier to assemble than I expected. The instructions were clear and the pieces f... The shed was far easier to assemble than I expected. The instructions were clear and the pieces fit together easily and precisely. The two flat packs were dropped off on my driveway and after 1/2 hour opening the packs and moving the pieces to my back yard, i began the assembly. It took 5 1/2 hours to complete. The base, which I built the previous week, took a weekend. Base is 3"-8" of CA6 compacted stone over 4 corner holes filled with concrete and a strap to tie down the pressure-treated frame which the Keter shed is anchored to. I screwed in coated wire shelving inside along with storage rails for the lawn tools. Rated 5 out of 5 by Basil from Very nice shed easy to put up.... Very nice shed easy to put up. Rated 5 out of 5 by CKNEEC from Great Shed As previously mentioned it takes a while to assemble but the instructions were clearly outlined and made the construction seamless. It was nice to have a few extra screws as well. I did have one corner where the predrilled holes would not line up but it was ok, the screws seated nicely right into the composite material. Rated 2 out of 5 by Brent from poor quality control I built a level platform for the shed and started assembling it. Many of the walls weren't cut to the same length. In fact a few of them were out of square, one in particular by a considerable amount. (I did not see a sample of the shed before I purchased it; I bought it based on the reviews and photos.) Since the walls did not line up evenly, I assumed the corner pieces would hide any imperfections and gaps. After fully assembling the shed, I noticed gaps on virtually all the corners. It is possible to line up one corner and have bigger gaps on the others, but I split the difference. Keter customer support offered to send one or two replacement wall panels, but that really doesn't solve my problem. Keter would have to send me all wall panels and make sure they are all the same. My solution is to buy fascia board, try to colour match it and add outside corners to the shed to seal the gaps. Keter advised they could do nothing else for me which is quite disappointing. Normally I would just return the entire unit. However, I built the platform to the specifications of the this shed. I have too much time invested, it's just easier to build the outside corners. Pros: Instructions easy to follow Materials seem to be of decent quality Cons: Poor quality control, panels aren't consistent size Corners of the shed should have outside corner trim (especially for the price) The instructions suggest a wood platform as one option. However, the shed walls install in the shed floor and drain through the floor which would allow water to get trapped between the wood platform and the shed floor eventually rotting out the wood quicker than it should. Can shelves be added on the inside? Hello, Customer service is available Seven days a week 8 am thru 5 pm, EST at 877-638-7056; we can also be reached by email from the following web site: http://uslparts.com/ or ttps://www.keter.com/en. We can help in obtaining the shelving parts. Hello HappyShed1234, * Make sure the assembly site is leveled. It&rsquo;s recommended to construct a wooden or concrete base as a foundation. What are the dimensions of the package for the unassembled shed and is it too heavy to transport with a station wagon? How wide are the doors. Is the installation relatively simple? Would anyone recommend hiring help or is it manageable? It is relatively easy to assemble, you will need to ensure that the ground is level prior to assembly.